Thyme imparts intense flavour to many recipes; however, the many potential health benefits of thyme available to you are amazing. 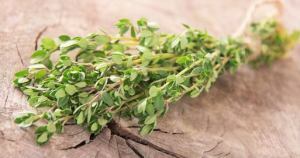 Thyme is a well-known herb used in culinary dishes in many parts of Southern Europe, in particular with Italian cooking. Yet due to the multipurpose uses of this Major herb, it has now being grown worldwide as a result. Definitely, this herb is worth growing in your garden or in a pot plant in the kitchen. As stated above, Thyme has many uses, not just within the culinary arena but back in the Ancient days Thyme was shown to have many other medical and health benefits. So let us have a look at some of the multipurpose and beneficial uses. Courage, Strength, Bravery was the order of the day. Over the centuries, Thyme was highly prized not only as a herb but was believed to enhance and increase the strength, courage and bravery of many warriors during the ancient times. The Romans added Thyme to their bathwater, which they believed, would further add to their strength, bravery and courage in battle. The Greeks had the same idea but would have their warriors massage with Thyme Oil, as this would have been a more potent form. The Ladies during the Medieval Times would have sprigs of Thyme sewed onto their scarves where they would give to their favoured Knight with the vision that would give added strength, courage, and bravery. So as you can see the same beliefs were around but covering a vast area of different civilisations and time. It was also used in the embalming process in ancient Egypt in Europe Thyme would be placed in the coffin to help the passage into the next realms after physical Death. Not only is it a great and powerful Herb to be used in cooking, but it has many medicinal properties. Even back as early as 3000 BC the Sumerians, found Thyme to have great Antiseptic properties one of many properties discovered over the years. Here are some medicinal properties that will benefit your health using Thyme. Thyme contains an essential oil called Thymol (commonly known as Oil of Thyme) which make this herb so important and vital that can benefit your health. Here are some of those properties. As an expectorants oil of Thyme helps loosen congestion by reducing the mucus in the lungs which allow the coughing to become more productive to help to clear the lungs. As an antispasmodic Thyme helps to suppress spasms, therefore, assisting in reducing any muscular tension. Such tension can be in the form of stomach cramps, spasms that can cause abdominal pain as a result. As a result, together with the expectorant as well as the antispasmodic properties, such actions helps in reducing inflammation located in the upper respiratory tract. This can be very beneficial for those suffering from illnesses such acute and chronic bronchitis. Both qualities work hand in hand, as the Oil of Thyme is contained in mouthwashes that can also help fight tooth decay. The antiseptic aspects can also help as a skin cleanser while the Antibacterial can be useful in treating fungal issues such as athlete’s foot. Ointments that contain the oil of Thyme (Thymol) can bring much relief against skin wounds and relief to insect bites. Thyme as a herb is safe to use, however, taking care in the use of the oil of Thyme for some could cause issues. The essential oil could cause some irritation to the mucous membranes and skin which may cause allergic reactions. As with most essential oils, it may not be recommended to use during pregnancy. It is advisable to avoid using essential oils internally without the recommendation and guidance of a professional practitioner with qualified knowledge of herbs and their essential oil properties. If not sure who to look for, try Natural Therapy organisations or professionals in Naturopathy and Aromatherapy for example. May Thyme be with you?